Despite the rise of food delivery apps like UberEATS, new research shows the vast majority of Australians still prefer home cooking and the shared experience of dinner at home, as a time for families to connect. 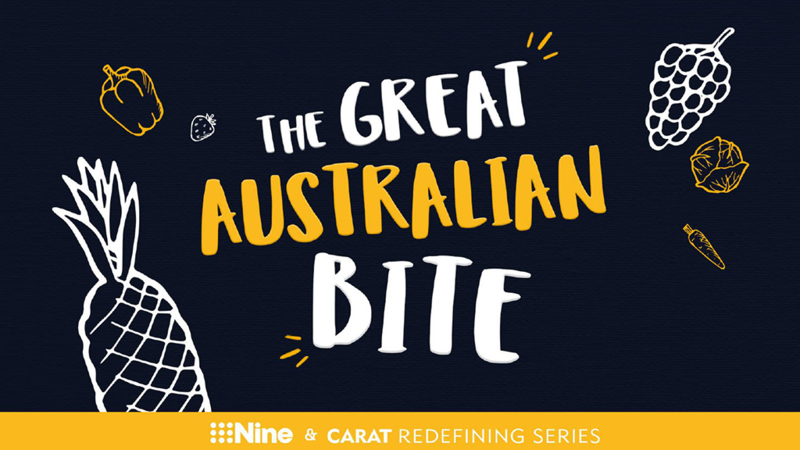 The landmark study – The Great Australian Bite – was co-commissioned by Nine and leading Australian media agency, Carat, as a way of examining the evolving Australian food landscape. The study finds many marketers are missing the mark in some of their strategies by emphasising the food and produce itself, rather than the shared experience of family and friends that is so often created around food. The Great Australian Bite study forms part of the Carat’s Redefining Series and is the first time the media agency, which represents some of Australia’s biggest food brands such as Woolworths, Cadbury, McCain and Sanitarium, has worked in partnership with a media owner to present a session in the research series. The study conducted by Hoop Research Group, who surveyed more than 1000 respondents, has highlighted the culturally significant role that food continues to play in Australian lives. More than 70 per cent of respondents reported eating a home cooked meal at the dinner table in the past 24 hours and 86 per cent said they believe that the family dinner tradition remains as important as ever. “Marketers in the food category need to think about memories as much as the meals,” said Mel Mullins, Director of Strategy and Experience at 9Powered. “Our research clearly shows the family dinner is still as important as ever, and also that any day can be a real occasion. The research also found that many food and beverage marketers were missing an opportunity by focusing much of their media spend on the traditional Christmas and Easter holidays rather than on more regular family events, such as birthdays and anniversaries. 90% of respondents reported that in their homes, birthdays outranked Christmas in terms of relevance to food, followed by anniversaries, and only then, Easter. Carat’s Head of Insights, Christine McKinnon, said, “Across all consumer-driven categories, we are seeing a significant shift in spending away from goods to experiences. In-home occasion-driven food experiences – such as ‘in-tertaining’, a return to childhood or cultural traditions, or a more pronounced emphasis on celebrations – are a big part of this. The study also confirmed the growing importance of Australians understanding the paddock-to-plate story of the food they eat and placing an emphasis on fresh food. More than 80 percent of respondents were interested in the story behind their food. 72 percent aim to eat only from sustainable resource, with 81 percent reporting their purchase decisions were influenced by what produce is in season. Despite a growing desire to eat fresh food, Australians admitted increasingly turned to their freezers to help them from a food preparation perspective. One in two is cooking meals in advance and freezing them, and one in three is defrosting something from the freezer every day. Marketers should also think about providing consumers with simple and easy recipes, with around 70 per cent of respondents saying they had already planned their next meal and around 50 per cent saying they discussed with family and friends what they planned to cook a week ahead.